If you want to compose a table service, here are some indications on the Bouquet de lavandes collection. In the kitchen, you will surely like the apron and the gloves and potholders for hot containers. As for the art de la table, we can offer you all tablecloth shapes to dress up your round, square, rectangular or oval tables. They can be either cotton coated or without anti-stain treatment. 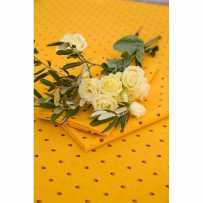 Very nice placemats complete the range in rectangular quilted, with possibility of coating. To perfect your service, a cloth bread basket with knots is made in the Bouquet de lavande print. The Bouquet de lavande ecru print is very delicate and romantic. Its pastel shades and small lavender blue flowers invite to poetry. The green scrolls of the frame add a charming note. The beige border, underlined with the same green as the vegetable stems, gives a perspective as in a staging. All ingredients come together in these lavander napkins to decorate a wedding table with elegance and originality. We can imagine very well the ecru Bouquet de lavande item as wedding napkins on a white tablecloth. Why not adopt the theme and garnish the reception tables with freshly cut lavender in season? They will bring a little more: their very soothing and unique fragrance. 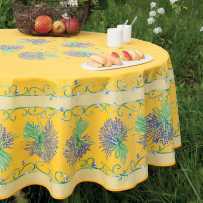 In summer, you will enjoy sharing a family meal on the terrace on a pretty table set with Bouquet de lavande placemats. Yellow is suitable for outdoor use because it absorbs sunlight without reflecting it. You can make color schemes, and alternate a beige napkin and a yellow one for more fancy.